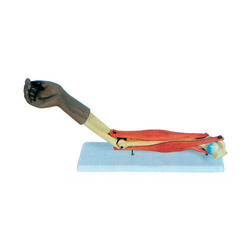 Functional Elbow Joint Life Size shows the shapes and correct origins and insertions of biceps triceps. · Size 12.5 x 12.5 x 32cm. · Life size, on stand. · Demonstrates flexion, extension, and internal / external rotation of the radius. · Includes flexible, artificial ligaments. - Demonstrate abduction, anteversion, retroversion, internal/external rotation of the radius. Include flexible, artificial ligaments. Mounted on stand. Demonstrates flexion, extension and internal / external rotation of the radius. Including flexible, artificial ligaments. Life-size, on stand. Demonstrates abduction, anteversion, retroversion, internal / external rotation of the radius. Includes flexible, artificial ligaments. Life size, on stand. 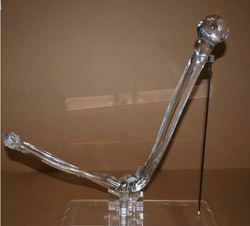 Manual elbow joint with an anatomically shaped under arm for mechanical prosthetic application. The integrated locking system allow the joint to lock in 12 different position. Size: 12.5 × 12.5 × 32cm. Life size, on stand. Demonstrates flexion, extension, and internal/external rotation of the radius. Includes flexible, artificial ligaments. Demonstrates flexion, extension and internal / external rotation of the radius. Includes flexible, artificial ligaments. Life size, on stand. Right elbow of a male with individual muscles plus muscular origins and insertions on the humerus, radius and ulna. The muscles can easily be attached to and removed from the corresponding areas of origin and insertion. Life size, shows the shapes and correct origins and insertion of biceps & triceps.Biceps and triceps are made of flexible material, extension and flecion can be shown as well as the antagonist relationship of these two muscles. On base. plastic base. Radius and ulna are the two bones of the lower part of the arm. Radius is concerned with bending and straightening of the elbow. Showing radius and ulna. Upper end of ulna grasp the lower end of the humerous.